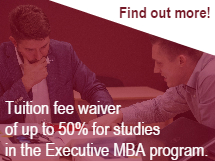 While having an MBA offers significant awards in terms of salary and recognition, completion of the degree is a substantial investment of time and money. Therefore, different program, tuition and finacing options need to be carefully evaluated. The RBS tuition policy is designed to offer students maximum flexibility and the shortest time to returns on investment. In addition RBS has negotiated or identified several financing options that allows you to focus on the program itself rather than how to finance it. Please, feel free to review other loan options as well.